The effect of simulated climate change was studied on populations of different beech (Fagus sylvatica L.) provenances. The climatic adaptation of six selected beech provenances (Farchau, Pidkamin, Torup, Gråsten, Bánokszentgyörgy, Magyaregregy), growing at the site of the beech provenance test of Bucsuta (H) were compared by the assessment of their enzymatic and non-enzymatic antioxidant system. The total protein content, peroxidase (POD) and polyphenol oxidase (PPO) enzyme activities as well as ABTS (2,2’-azino-bis-(3-etylbenzothiazoline)-6-sulfonic acid) antioxidant capacity were measured from the leaves of selected trees. The identification and quantitative determination of major leaf polyphenols was also determined from the same samples. By the comparative analysis of the enzymatic and non-enzymatic antioxidant systems of the provenances it was concluded that the selected chemical variables were suitable for the assessment of the climatic stress, simulated by the translocation of the investigated provenances. POD enzyme activity as well as total protein content and the concentrations of certian polyphenols could be potential chemical indicators of the adaptation process and could be used in the forecasting of the future effects of climate change and in the selection of propagation material in the future. 1. Albert L., Hofmann T., Visi-Rajczi E., Rétfalvi T., Németh Zs. I., Koloszár J. et al. 2002: Relationships Among Total Phenol and Soluble Carbohydrate Contents And Activities of Peroxidase and Polyphenol Oxidase in Red-Heartwooded Beech (Fagus sylvatica L.). 7th European Workshop on Lignocellulosics and Pulp, Turku/Abo, Finnland, Proceedings 253–256. 6. Ellenberg H. 1988: Vegetation ecology of Central Europe, 4th ed. Cambridge University Press. 10. Hofmann T., Tálos-Nebehaj E. & Albert L. 2017: Leaf polyphenols as indicators of climatic adaptation of Beech (Fagus sylvatica L.) – an HPLC-MS/MS via MRM approach. International Labmate 42(3): 12–14. 15. Shannon L. M., Kay E. & Lew J. Y. 1966: Peroxidase isoenzymes from horseradish roots. The Journal of Biological Chemistry 241: 2166–2172. 19. Visiné Rajczi E., Hofmann T. & Albert L. 2017: Peroxidáz és polifenol-oxidáz enzim aktivitás és az összfehérje tartalom, mint a bükk (Fagus sylvatica L.) klimatikus adaptációjának lehetséges indikátorai. In: Bidló A. & Facskó F. (eds): Soproni Egyetem Erdőmérnöki Kar VI. Kari Tudományos Konferencia Absztraktkötet. Soproni Egyetem Kiadó, Sopron, 260–263. 20. Zolfaghari R., Hosseini S. M. & Korori S. A. A. 2010: Relationship between peroxidase and catalase with metabolism and environmental factors in Beech (Fagus orientalis Lipsky) in three different elevations. International Journal of Environmental Sciences 1: 243–252. Albert L., Hofmann T., Visi-Rajczi E., Rétfalvi T., Németh Zs. I., Koloszár J. et al. 2002: Relationships Among Total Phenol and Soluble Carbohydrate Contents And Activities of Peroxidase and Polyphenol Oxidase in Red-Heartwooded Beech (Fagus sylvatica L.). 7th European Workshop on Lignocellulosics and Pulp, Turku/Abo, Finnland, Proceedings 253–256. Ellenberg H. 1988: Vegetation ecology of Central Europe, 4th ed. Cambridge University Press. Hofmann T., Tálos-Nebehaj E. & Albert L. 2017: Leaf polyphenols as indicators of climatic adaptation of Beech (Fagus sylvatica L.) – an HPLC-MS/MS via MRM approach. International Labmate 42(3): 12–14. Shannon L. M., Kay E. & Lew J. Y. 1966: Peroxidase isoenzymes from horseradish roots. The Journal of Biological Chemistry 241: 2166–2172. Visiné Rajczi E., Hofmann T. & Albert L. 2017: Peroxidáz és polifenol-oxidáz enzim aktivitás és az összfehérje tartalom, mint a bükk (Fagus sylvatica L.) klimatikus adaptációjának lehetséges indikátorai. In: Bidló A. & Facskó F. (eds): Soproni Egyetem Erdőmérnöki Kar VI. Kari Tudományos Konferencia Absztraktkötet. Soproni Egyetem Kiadó, Sopron, 260–263. Zolfaghari R., Hosseini S. M. & Korori S. A. A. 2010: Relationship between peroxidase and catalase with metabolism and environmental factors in Beech (Fagus orientalis Lipsky) in three different elevations. International Journal of Environmental Sciences 1: 243–252. 1. Horváth, A. & Mátyás, Cs. (2014): Estimation of increment decline caused by climate change, based on data of a beech provenance trial. Bulletin of Forestry Science, 4(2): 91-99. 1. Gálos, B., Mátyás, Cs. & Jacob, D. (2012): The role of afforestation in mitigating climate change. Bulletin of Forestry Science, 2(1): 35-45. 3. Czúcz, B., Gálhidy, L. & Mátyás, Cs. (2013): Present and forecasted distribution of beech and sessile oak at the xeric climatic limits in Central Europe. Bulletin of Forestry Science, 3(1): 39-53. 4. Mátyás, Cs. & Kramer, K. (2016): Adaptive management of forests and their genetic resources in the face of climate change. Bulletin of Forestry Science, 6(1): 7-16. 5. Mátyás, Cs. & Borovics, A. 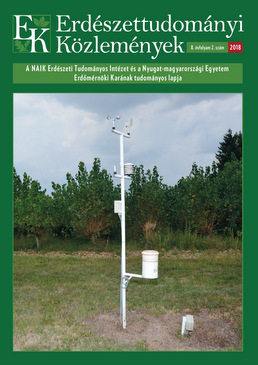 (2014): "Agrárklíma". Bulletin of Forestry Science, 4(2): 7-8. 6. Mátyás, Cs. (2018): In the whirl of passing time. Bulletin of Forestry Science, 8(1): 9-10. 7. Czimber, K., Mátyás, Cs., Bidló, A. & Gálos, B. (2018): Machine learning approximation of Járó-table (table of applicable targeted forest stands and their growth for each forest site). Bulletin of Forestry Science, 8(1): 93-103. 8. Mátyás, Cs., Kóczán-Horváth, A., Antoine, K. & Cuauhtémoc, S. (2018): Juvenile height growth response of sessile oak populations to simulated climatic change based on provenance test data. Bulletin of Forestry Science, 8(1): 131-148. Gálos, B., Mátyás, Cs. & Jacob, D. (2012): The role of afforestation in mitigating climate change. Bulletin of Forestry Science, 2(1): 35-45. Czúcz, B., Gálhidy, L. & Mátyás, Cs. (2013): Present and forecasted distribution of beech and sessile oak at the xeric climatic limits in Central Europe. Bulletin of Forestry Science, 3(1): 39-53. Mátyás, Cs. (2018): In the whirl of passing time. Bulletin of Forestry Science, 8(1): 9-10. Czimber, K., Mátyás, Cs., Bidló, A. & Gálos, B. (2018): Machine learning approximation of Járó-table (table of applicable targeted forest stands and their growth for each forest site). Bulletin of Forestry Science, 8(1): 93-103. Mátyás, Cs., Kóczán-Horváth, A., Antoine, K. & Cuauhtémoc, S. (2018): Juvenile height growth response of sessile oak populations to simulated climatic change based on provenance test data. Bulletin of Forestry Science, 8(1): 131-148.